Before scripted responses in QP. Before “messaging”. Before every utterance from a Minister’s mouth had to be cleared by the PMO, sitting MP’s actually communicated directly with their constituents and other members of the public. All by themselves. Yes. They did. I’m not making this up. I know that on all sides of the House, there are Members who do good riding work…. no doubt. But in these days of über controlled messaging, rare is the MP who will just thrown out an email or letter in response to questions. No way. What if they said something that was counter to party lines? What if they strayed from the key messages that the PMO (or party leadership in the case of Opposition parties) wishes to convey. 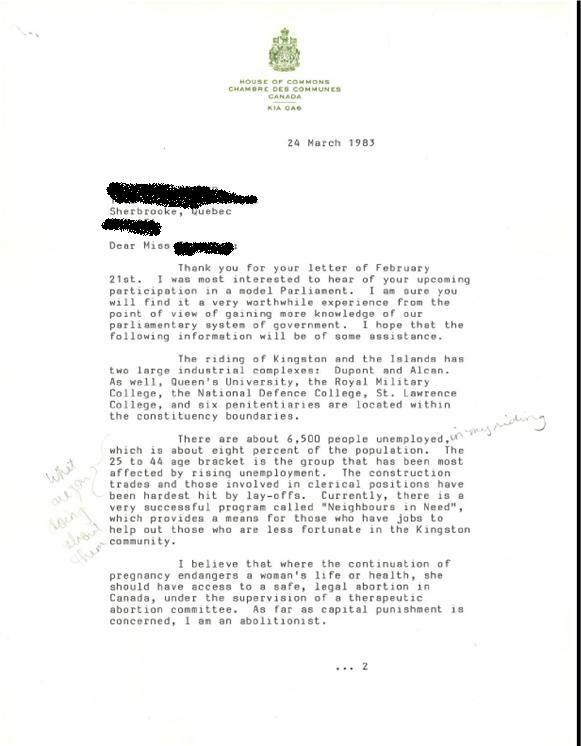 The Resident Love Goddess was rummaging through some old boxes in the crawl space yesterday when she came across this letter sent to her by Flora MacDonald who was then the MP for Kingston and the Islands. She asked for some information to help prepare for a school debate. She wasn’t even the MP for my RLG’s riding! Imagine. Asking a number of specific question about an MP’s stand on different issues – some quite divisive – and getting a clear and unambiguous response… not a form letter sent by a staffer based on a template approved by the PMO. In any case, the days that saw speedy and complete responses from our MPs are largely over. 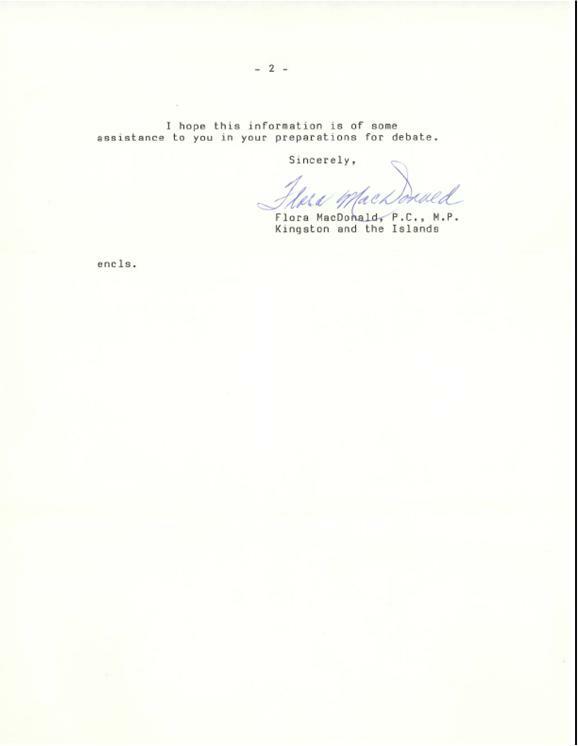 Public Servants like Mrs. MacDonald would have had a difficult time functioning in this climate of muzzles and straight jackets. And just to note, the Honourable Flora MacDonald just turned 85 and is involved with a number of volunteer organizations.